Ah, Koreans and their ghost stories. You gotta love ‘em. And Phone is a good one. There really is no comparison between Western thrillers and horror movies and Asian ones. Culturally we’re afraid of different things. While ghosts may scare us in the West because of our issues with the whole concept of death, in Asia there persists an almost phobic superstition of ghosts. There are a few other things that I think may also be cultural…like Koreans really, really are obsessed with their electronics. So the producers of this film put two and two together and thought, “Ah, if we really want to scare a Korean audience…put a ghost in a phone!” Genius. Alas, many Westerners might find that silly, but this is not the only Asian film that puts the fear of technology on screen. I mean Ringu had everybody labeling their blank video tapes for years! Another trend I’ve seen is that Asian films are far more concerned with giving the ghost a justifiable reason to be hanging around trying to get some attention or revenge. And this movie relies a little too much on a Stir of Echoes ending…then again Stir of Echoes totally rips off Edgar Allan Poe! So there. The literary term I’d like to look at here is Anthropomorphism. That’s when we attribute a human element to an inanimate object, as if it were alive or…well…human. I know this sounds the same as personification, but it’s not. Personification is giving things a human trait, while anthropomorphism is really seeing these things as humans…in a way. 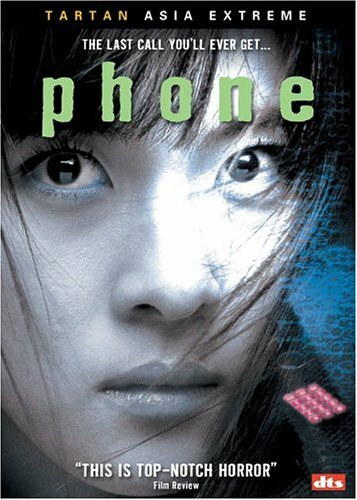 And this phone in this film called Phone and in Korean 폰 which is pronounced PHONE…so I think we’re getting the big picture here, is definitely a character that becomes menacing as the ghost uses it to infect people so they can do her bidding. Pretty nifty stuff. Seo-woo Eun's chilling portrayal of a possessed child, Young-ju. Oh, and as a side note…Young-Ju has to be one of the creepiest kids in a horror movie EVER. Great performance by a cute/evil little actress! Just outstanding. A little like personification but different.